Most of us love words as they let us conjure up ideas in the imagination. I remember well the telling of campfire horror stories as a Boy Scout. The storyteller had us on the edge of our logs and none of us slept comfortably for days afterwards. It was exhilarating and terrifying at the same time! That said - words are quite a crude way of making a point. Their meaning can only be as detailed as the definitions the receiver attaches to them; and there is plenty of room for misinterpretation, whether through nuance or linguistic differences. For centuries, we have used words to teach, but Virtual Reality (VR) offers us the chance to literally show others what we mean. It can remove the ambiguity of words by providing all parties to a communication with the same information, and in an immediate way. Instead of teachers “describing”, students will be able to “experience”. Learning can become a first-person activity instead of a second-hand one. VR is nothing new. To find the world’s first flight simulator, we have to go all the way back to a mechanical marvel of 1929. Called the ‘Link Trainer’ after its inventor, Edwin Link, it presented pilots with instrumentation and even moved appropriately according to how the controls were handled. Pulling up, diving, banking - it was all possible. The Link Trainer is the first example of something approaching a genuinely immersive experience. 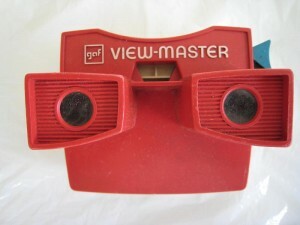 If you grew up in the 70’s and 80’s, you probably at least used a ‘Viewmaster’ toy (still very much available, and as you might expect, significantly evolved!). A headset using the now commonplace differentiated views for left and right eyes which creates the illusion of a 3D space, these were originally military tools for training pilots and gunners in the range estimation of target planes and ships. 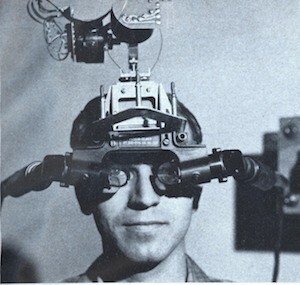 The first head mounted system as we’d recognise it today began development in 1966 at MIT’s Lincoln Laboratory. It was so heavy, it had to be suspended from a ceiling. It was humorously known as the ‘Sword of Damocles’ - perhaps a foreboding of things to come? Bringing VR to the modern day, we see Facebook’s acquisition of VR specialist, Oculus (and it’s product, the Rift), back in 2014 for $2bn. Mark Zuckerberg is betting big on headsets that provide ‘immersive 3D experiences’; yes that’s movies and television, but also tools for business meetings and gaming. No doubt his ultimate goal is headsets that scan our brains then transmit thoughts to friends in the way we share cat pictures today. Why is Zuckerberg betting big on VR? One word: Presence! We have tools like Skype and Slack which can be the cornerstone of distributed work teams and allow us to connect with people across any distance. But once our brains believe on some level that we’re in the same space as others; that’s when we’ll replicate the offline benefits of spontaneous interaction and that all important non-verbal communication. In short, we will communicate more freely and effectively, because more of the problems of technology – clunkiness, lack of realism – have been removed. And once we’ve made the virtual world real, we can also make it better. The next step in VR is multiple or selectable realities. This could mean elegant and simple benefits like algorithmically enhanced colour schemes to improve the experience for colour blind people. Or it could mean a more sinister world in which brands penetrate our every waking moment. VR not surprisingly sits alongside a host of other technologies. Whilst VR is about immersion, Augmented Reality (AR) differs to the VR experience by using information or communicating further meaning onto the real world experience. Future tourists may walk round Stonehenge and have reading matter piped into view exactly according to where they look. Equally, having your field of vision bathed in red for an emergency situation is something every gamer understands, and which is another great example of AR communication. Then there’s robotics. Returning to the flight simulator, robotics have been used for a realistic VR experience since the 1950s; their improved precision and flexibility mean that robots are certain to be the hands and feet of the VR experience. Where are the opportunities for VR? Australian Property Developer ‘Thirdi’ is developing 'Arti', an Augmented Reality app to let customers explore new developments from their phones/tablets before they’re built. As well as seeing exteriors, potential buyers can ‘walk’ through kitchens and other rooms - even suggesting modifications as they navigate. Advances in surgical training will certainly take advantage of VR. It reduces reliance on human cadavers and animals while allowing trainees to easily fail and repeat techniques. During one study of surgical residents, those who undertook VR simulation of gall bladder surgery were six times less likely to make errors and 29% faster than those who did not participate in the training. Moving beyond training, we already have tools like ‘Da Vinci’ robotic surgery. Combine this with VR and surgeons will soon be able to ‘get inside’ an organ to see detail previously unavailable. Not a bad step on the journey towards Nanobot surgery, where tiny robots will work inside our bodies. The opportunities for commerce have barely begun to be realised. Fitting our your first apartment from IKEA? You can already look at kitchens and i've no doubt you’ll soon be able to see how that shelf unit looks in the corner of the living room. Want to try out 10 lipsticks in the time it takes to do one? No problem, Sephora already makes it possible. Online shopping will certainly take on a new dimension! Both Samsung and Oculus advise adults to take 10 minute breaks from their VR devices every half hour. People often report nausea, eyestrain and headaches. Professor Jeremy Bailenson of Stanford University makes a case for VR affecting how a user thinks and behaves. Indeed, a teacher friend of mine recently told me (on a lesser level) that she witnessed one of her six year olds trying to ‘swipe’ the tank at the aquarium. The child’s mind has been conditioned to believe that anything behind glass is virtual – and the same sort of thought patterns will no doubt become evident in VR situations; especially for those born and brought up once VR is commonplace. Meanwhile, recent studies of lab rats at the UCLA Keck Centre for Neurophysics revealed abnormal patterns of activity in rat brains, including 60% of neuron shut down in VR environments. What's not understood however is whether this is a good or bad thing in the context of the experiment. Then, there’s the cost. VR currently takes significant financial investment to develop a virtual environment. That said, I’ve no doubt it’ll follow the same path as web development, with plug-and-play modules becoming the norm. Having tried Oculus Rift myself as part of a group, one thing struck me. Everyone starts wondering how VR will change the future. A sculptor in the group got excited by the opportunities that simply wouldn’t have been possible before. An F1 fan said they’d love to be in the pit lane as the cars came in for tyre changes. One lady from a well known charity remarked how effective it would be to bring alive the struggles of the people they help – ‘the potential for fundraising is incredible’. There’s so much more to understand. There are clearly incredible opportunities, but also significant risks. As haptic technology becomes the norm, will we even leave the house? Or will digital detoxing become essential for us to re-adjust to “real” reality? Like any technology, VR can be used for good and bad, but unlike most technologies, VR can amplify the human experience beyond all expectations. If you’re the Dalai Lama, experiences can create empathy and drive human connection. If you’re Donald Trump, experiences can spread hate and fear. Both angles take the viewer out of their own universe and plunge them completely into another. The ethical dimension never goes away and neither should it!